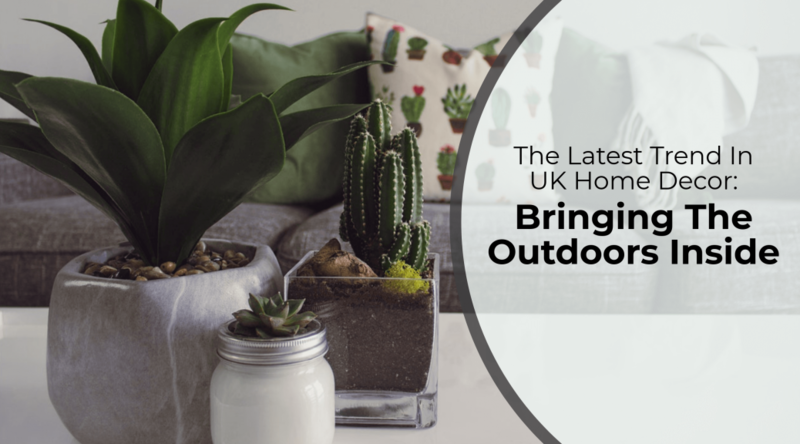 One of the latest trends in UK home decor is focusing on blurring the lines between the indoors and outside spaces, combining traditional and beautiful elements of each to create a spacious, nature inspired home. Creating a space the mimics the beauty, shapes and colours or nature can be achieved by making a few small changes to your home. If you’re opting for an airy and spacious feel, try incorporating several pieces of greenery and neutral tones. On the other hand, if you’d prefer to create a cosy and welcoming environment, try utilising autumnal colours and warmer tones. Here are a few things you can do to bring the outdoors inside. One of the wonderful things about interior design is that inspiration can be found anywhere you look. If you want to incorporate elements of your surroundings and tie in snippets of nature, simply going for a walk in your local area could offer numerous ideas. Whether that involves taking ideas from the decor of your local cafe, looking at the architecture that surrounds you or spotting your favourite colours in a piece of wall art, you won’t be short on inspiration. However, even if you do need a helping hand when coming up with ideas, there’s loads of wonderful examples of bringing the outside inside on websites like Pinterest and Instagram. Colour has a significant impact on the overall feel and aesthetic of a room, making it one of the best ways to create a certain atmosphere. Furthermore, there have been several studies into the psychology of colour that have shown certain colours can have an impact on an individual’s mood. Green is associated with health and peacefulness, where as purple is associated with wisdom and being successful. The colours you choose should reflect how you’d like to feel in your home. One of our UK home decor tips is to observe your surroundings. Local architecture can be a brilliant source of inspiration – especially if you live in an area, such as London, that is renowned for its architectural structures. Take note of any specific buildings that jump out at you because of their colour or their aesthetic. As well as taking inspiration from your local architecture, keep a look out for any garden areas that are filled with colourful flowers and plants. You might come across a few bright coloured plants you haven’t seen before that could give you more of an idea on the colours you’d like to use in your home. Another fantastic way of choosing colours is to consider the seasons. Each season is associated with a different colour palette that you can utilise in your home. Winter colours often include plums, deep reds, greens, greys and dark blues; whereas autumn colours usually refer to oranges, yellows, reds, browns and coppers. Spring and summer colours are both very similar and involve much brighter colours like pink. When trying to bring the outdoors inside, another UK home decor top tip is to get creative with space. Regardless of the size of your home, there are a number of things you can do that make the most of existing space – try playing around with mirrors and furniture. One thing that many people forget to consider when trying to create a spacious feel in a more compact room is the size of their furniture. Smaller furniture that’s closer to the ground is renowned for making rooms appear much larger than they are because it appears less cluttered. Try investing in a lower settee and coffee table and avoid filling your room with more furniture than necessary. If you have a smaller home or apartment or get a limited amount of natural light throughout the day, try getting clever with mirrors. Mirrors are a fantastic accessory for any bare wall space; however, they also do a brilliant job at making rooms appear brighter and more spacious. Hanging mirrors directly opposite windows allows any natural light to reflect back into the room, therefore creating a brighter space. Along with this, they create the illusion of a larger room if placed at the furthest point of a room. Potted plants are a great low cost option for people who want to include elements of nature within their home. With so many varieties of indoor plants available from local garden centres, you won’t be limited on choice. You could even try your hand at growing your own plants if you can’t find what you’re looking for. Don’t be afraid to be big and bold with your plant choices, try adding in some oversized potted plants on tables or in the corner of each room. Doing this creates a balance between smaller more delicate plants and those that are more imposing. If you’d like to implement more colour rather than focusing purely on predominantly green plants, introducing small but bright flowers throughout your home is a great solution. Flowers like African Violets and Wax Begonia bloom all year round, are easy to maintain and come in a variety of colours, therefore making them perfect for adding pops of colour throughout your home. In order to truly experience the feel of nature within your home, we think it’s important to embrace natural light. Try to avoid blocking your windows with furniture or ornaments as this will prevent as much natural light coming into your home. Not only is natural light a big part of bringing the outside in, it also offers a variety of health benefits. It has been shown to increase red and white blood cell count, balances hormones and prevents vitamin D deficiency. Simply opening the curtains and cracking open a few windows really can do you the world of good. Nature is a combination of different textures and materials so, when bringing the outside in, your home should be too. That’s why our final UK home decor top tip is to utilise a variety of materials in every room. Wood doesn’t just have to be used for flooring; it also makes a great statement piece in any home. For example, try using small sanded pieces of wood as place mats, invest in beautiful and unusual wooden sculptures and ornaments, or get imaginative with tree stumps and turn them into candle holders or clocks – the possibilities are endless. Light and airy fabrics can add a touch of elegance to any room whilst creating a spacious feel. Try using materials like chiffon and linen as curtains around your windows and doors that will blow gently in the breeze. Also, if you want to add a fresh, flowery scent to your home, spay the materials with perfumes: each time the breeze blows the fabrics, the scent will fill the room.